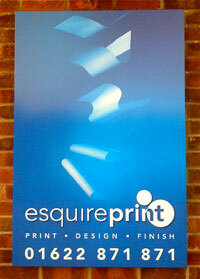 Established in 1992, Esquire Print is a reliable printing company offering creative design and high quality litho and digital printing. Originally a letterpress printers located in Offham near West Malling, the Company moved to Aylesford in 1995 and then, in 1999, to the current location of Nettlestead, mid way between Maidstone and Tonbridge. The hot metal may have been replaced by litho presses and digital equipment but the quality of service still remains. What separates us from the competition is our eye for detail and a true understanding of the customers' requirements. A flair for design coupled with fine printing are the primary motives for us but we have a keen appetite to impress so that you will want to recommend us to your colleagues and friends. Our business is built on reputation and referral; we rely on our satisfied customers spreading the good word of what we do and that's why we really focus on building lasting relationships. "Quality print and design with a personal touch!"